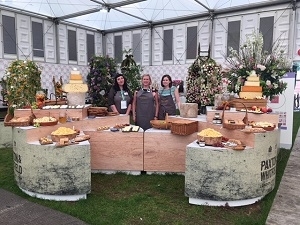 For the second year running Paxton & Whitfield have been proud to set up a stand in the Grand Pavilion at the RHS Chelsea Flower Show, providing cheese for the gala opening. 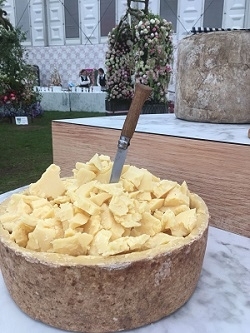 Running from the 22nd to the 26th May, innovative designs and the most beautiful of flowers have inspired gardeners and garden lovers around the world and this year, there was even a cheese feature with Welcome to Yorkshire teaming up with Wensleydale Creamery, using a craftsman’s cottage to showcase artisan cheese production. 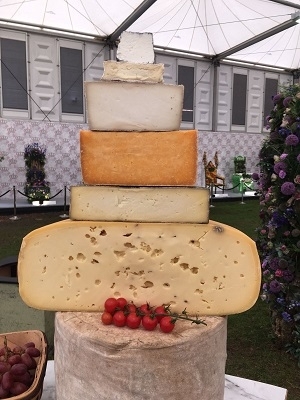 There are actually a number of cheeses where flower, trees and plants are integral to their flavour and appearance. Some of the prettiest examples would be fresh goat’s cheeses made by French fromagerie Segalafrom and bestowed with the coveted sign of quality assurance, ‘red label’. Their range of ‘Meringues’ come with a scattering of either rose petals, lavender or violets which bestow a subtle perfume and gentle flavour to the delicate cheese. These are available on request from our Jermyn Street store. Eve, Wild Garlic Yarg and Mothais sur Feuille are all wrapped in leaves. Eve, brainchild of one of Paxton & Whitfield’s favourite cheesemakers, Pete Humphries from White Lake Cheese, is a rich, citrusy goat’s cheese which has been washed in cider brandy and wrapped in a vine leaf to help retain moisture. The contrast of the vibrant green leaf against the fluffy white exterior of the cheese adds colour and contrast to any cheese board. Multi award winning Wild Garlic Yard adds equal interest with dark green tones of wild garlic encasing the natural rind of this Caerphilly style Cornish cheese. The flavour of the garlic is subtle enough to not overpower the savoury taste of the cheese, yet adds an undeniable and irresistible tang. Mothais sur Feuille is made by Paul Georgelet who instigated the renaissance of a traditional cheese making technique. Leaves from sweet chestnut trees are harvested in the autumn and used almost as trays for young, moist goat’s cheeses to sit on as they mature. The leaves encase the young cheese, taking their moisture and helping to mature it. As the cheeses dry, they take back moisture from the leaf as needed which helps to break down the cheese under the rind, giving a velvety soft interior. The use of herbs and spices is popular in cheese making, with the flavours of garlic, thyme, pepper, mustard and bay being amongst those often used to add an extra dimension to a cheese. Fleur du Maquis is a delightful example of this, although the usage of herbs in this cheese could never be described as subtle. Exclusive to the island of Corsica, the semi-soft ewe’s milk cheese is encased in a mixture of rosemary, fennel and coriander seeds, birds eye chillies and juniper berries. These add an intense aroma and a create an excellent accompaniment to the robust, sweet, musty flavours of the cheese. Finally, one of the newer and more unusual additions to the Paxton & Whitfield counter is Alp Blossom. Alpine in style and made by an all-female team in the Bavarian Alps using raw cow’s milk, the cheese is enrobed in a delicate and visually stunning array of wild edible flowers and herbs, including rose petal, cornflower, marigold, lavender, parsley, marjoram, oregano, lovage and chive. 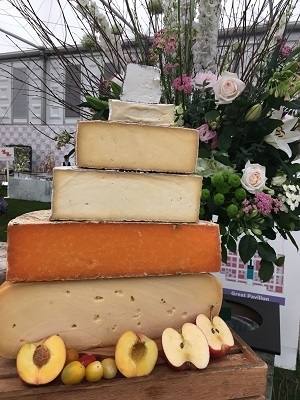 It’s not just the RHS Chelsea Flower Show where cheese and flowers go hand in hand!